It’s been eight long years since Capcom’s venerable Mega Man franchise last slapped a new numeral onto the end of its name, a span that’s seen the Blue Bomber’s NES contemporaries—most notably Nintendo’s own Mario and Zelda games—evolve dramatically in response to increasingly powerful technology and changing gaming philosophies. But while the franchise’s latest title, Mega Man 11, does its damnedest to try to teach itself a few new tricks, this might be the point where even the most devoted practitioners of the time-honored art of murdering octets of themed robots to steal their magical arm-guns have to accept that this series has comfortably settled into its limits, probably for good. Gifted with a perfectly serviceable faux-3D makeover, and a plot that couldn’t matter less if it tried, 11 once again pits its robot hero against the forces of the cartoonishly nasty Dr. Wily. 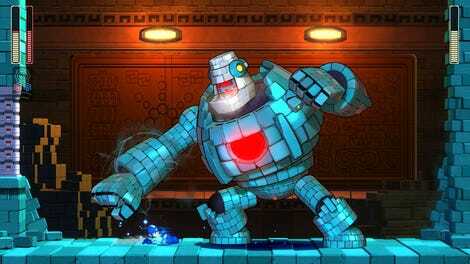 Said battle comes in the form of eight new stages to run and gun through, with eight new bosses lurking at their ends. Despite boilerplate names like Block Man, Impact Man, and Torch Man, this is easily the most colorful bunch of baddies the series has ever offered up, varying wildly in size, and featuring sharp little details like the electrodes poking jauntily out of Fuse Man’s silhouette. That same love has been lavished on the way they fight, too: Rather than execute a few simple patterns of jumps and attacks, each boss battle is now a multi-phase affair, with enemies tossing out super moves and even the occasional full-on transformation. All of these flashy theatrics—which put a welcome edge onto the long-standard process of learning and overcoming a boss—are empowered by the Double Gear system, the game’s one big contribution to the Mega Man canon. A fancy way of saying “short-lived bursts of extra power or speed,” the Gears’ powers aren’t just confined to your enemies. They’re also the biggest tool in Mega Man’s new arsenal—and in the game’s efforts to justify its existence as more than just a pleasant but brief nostalgic stint. Of the two gears available, the obvious standout is “Speed,” which allows you to slow down the world for brief but critical periods at the touch of a button. It would be hard to overstate how much this simple addition changes the feel of the game’s levels—an otherwise well-crafted, but not especially notable, collection of interesting gimmicks and corridors filled with the customary assortment of spikes and pits. The Mega Man formula typically stacks a horde of fast-moving, relatively fragile enemies against your hero, an aggressive, screen-clearing powerhouse who blasts them away to clear his path. By making Mega Man the most maneuverable thing in the equation, it inverts the basic question these games have been asking for 30 years, changing it from “How do I eliminate the obstacles in my way?” to “How do I elegantly weave my way through this situation in the fleetest, most stylish way possible?” Don’t want to deal with an awkwardly placed turret? Slow down time and navigate around it. An enemy leaps at you? Smack the Speed button, slide under them as they drift lazily over your head, and get on with your day. It’s empowering stuff, in a way that yet another flashy gun or attachment for your robot dog couldn’t match. The Speed gear’s mate, the Power gear, is far less of a game-changer, simply boosting your damage output and tweaking your special weapons, but it does force you to balance a shared heat gauge to keep either of the pair from burning out. And if that feels too restrictive, there’s also a low-key upgrade system on hand to ease the pressure and keep a careful player in bullet time as often as not. The game’s later levels push even this upgraded slowdown ability to its limits, but it never takes the full plunge into masochistic demands for perfect, precise play. Which is kind of a shame. Because while the ability to slow down time is legitimately transformative—especially once you’ve picked up a few upgrades, allowing Mega Man to move at his normal speed while the rest of the world crawls along in digital molasses—it doesn’t change the fact that “biggest alterations to the Mega Man formula” hasn’t been a very competitive field in decades. A little extra bite might have knocked something interesting loose here, a different tone for a team that’s grown too comfortable playing a single note. On a fundamental level, these are games about learning and exploiting patterns, and despite a few flashes of brilliance, Capcom seems just as trapped in one of its own. The times have changed. Gaming has changed. Mega Man hasn’t. Once upon a time, eight bosses and a handful of increasingly vicious Dr. Wily stages were all that a player might have needed to wile away day after day, scribbling down passwords and carefully memorizing the position of each precious E Tank. (Filed mentally right next to their grid map of Hyrule, or the locations of all the hidden 1-UP mushrooms in Super Mario Bros. 1.) But with modern conveniences like between-level saving and the ability to toss plentiful in-game currency at your supply of extra lives and mid-level recharges, those replayable, compulsive elements have been steadily whittled down. And even with its not-infrequent highs, Mega Man 11 doesn’t have anything more substantial to offer in their place, instead relying on a basic skeleton that can’t help but creak as its 30th anniversary arrives. Mega Man 9 (and, to a lesser extent, 10) overcame these pitfalls with a combination of laser-guided nostalgia and rock-solid platforming precision, but 10 years (and any number of more ambitious retro platformers—cough, Shovel Knight, cough) later, and even 11’s biggest swings for the unorthodox leave it feeling like little more than a trifle. In a medium that evolves by the day, 11 is content just to be a pretty good Mega Man game—for better and for worse.